.....We are currently testing several powerplent modifications to determine if more horsepower can be obtained without sacrificing the outstanding reliability that we now have. These modifications are of the bolt-on variety and include a different carburetor, a tuned exhaust system, and modified cylinder heads, all of which are installed on a stock Oman engine. If successful, this development effort should result in a 23 h.p. engine with improved fuel consumption. All of these modifications could be retro-fitted to any Quickie engine already in service. .....A parallel effort is being made to reduce the noise and vibration l2vols, even though they are currently comparable to other light aircraft like the Cessna 150 and Grumman Trainer. This effort, if successful, will also be retrofittable to any Quickie. .....We expect to have completed sufficient test time by August, 1979 to make a decision on whether to make any or all of these modifications available to Quickie builders. .....No further information on these developments will be released prior to further testing, so please ask us. .....Also, in response to numerous requests, we are developing a spinner for the Quickie, and expect to test it in late April. An outside view of our 5,000 square foot shop. .....There seems to be some misunderstanding as to what radios will work in a Quickie. This is probably due to our previous comments on hoping to test a lightweight, low cost NavCom early in 1979. .....First of all, any of the normal aircraft radios can be fitted to the Quickie with no particular problems. Weights do not vary much from radio to radio. The RST NavCom being developed have reduced cost as compared to other similar radios. 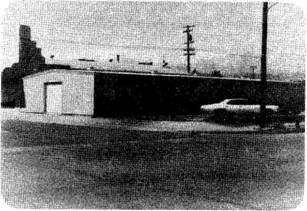 A check with RST, Inc., prior to publishing this Quickie Newsletter resulted in us deciding that it will be late 1979, at the earliest, before their unit is available. Because of this, we would encourage any Quickie Builders who find good deals on existing production radios to go ahead and buy them, rather than wait on an item that is not developed yet. .....See the Builder Hints section for an antenna design recommended by one of our builders. 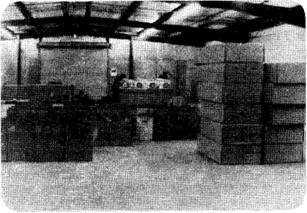 To the right are canopy boxes, in the middle are engine installation packages and boxes holding machine and welded parts, and at the far end are Quickie engines being modified. .....Since foreign pilots are faced with the same fuel prices as the U.S. will have in 2-5 years ($2.00 plus per gallon), it is no wonder that cnuch interest in the Quickie has been expressed throughout the world. .....Thus far, we have shipped two kits to the Netherlands, one to West Germany, and one to Scotland, in addition to the seven kits to Canada. To rent a Cessna 150 in most of these foreign countries cost at least $30.00 per hour. That means, that unless you are rich, or use the aircraft for business, the typical citizen cannot afford to fly for sport. One of our European customers said that the Quickie was the only means by which he could afford to fly an aircraft. Gas prices in his country are over $2.50 per gallon. .....Ben Dysart, one of our Quickie builders, haa been looking into the possibility of having a fuel cell built for his Quickie by a race car cell manufacturer. .....For those of you who are unfamilar with what a fuel cell is, it is used on race cars to minimize the possibility of rupture and subsequent fuel leakage in the event of a crash. Usage of this item by Indianapolis racers has greatley reduced fires and injuries resulting from high speed crashes. The Air Force uses a similar technique in their fighters and bombers to minimize battle damage. .....Ben says that his preliminary investigation indicates that a fuel cell built specifically for a Quickie would fit inside the current fuel tank, add a pound or two of weight, and reduce fuel capacity by abour 3 to 5 percent. The price would be about $150.00, if he can give the manufacturer an order for about 10 units. .....We encourage builders to come up with good sugge,stions to improve the Quickie. We think that Benâs idea has merit; however, we have not tested the proposed fuel cell and so cannot officially recommend it. The fact that the Quickie carries very little fuel, and the fact that the Quicideâs composite structure has little metal to cause sparks in the event of an accident tends to reduce the need for the fuel cell. However, for those of you who demand the ultimate in safety, the fuel cell may be a good choice. Based upon the response that Ben receives from this paragraph, he will decide whether to pursue the matter further.